Coslys Organic Shower Gel with Olive Oil cleanses all skins gently with its soap-free formula. It is enriched with protective and soothing organic Olive Oil and Honey. Ideal for daily use, Coslys Organic Shower Gel leaves your skin smooth and soft with a 100% natural fresh fruity fragrance ! With this organic shower gel, your skin will be silky soft ! 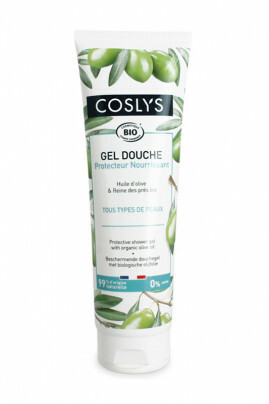 Apply COSLYS Organic Olive Oil Shower Gel on damp skin, lather then rinse. In case of contact with the eyes, rinse abundantly. Aqua (water), spiraea ulmaria flower extract* (organic meadowsweet floral water), sodium coco-sulfate (anionic surfactant from coconut, palm-kernel and glycine), decyl glucoside (anionic surfactant from glucose), polyglyceryl-2 laurate (lipid-enriching agent from palm-kernel and coconut), cocamidopropyl betaine (amphoteric surfactant from coconut), sodium chloride (salt), glycerin (plant based glycerin), mel* (organic honey), olea europaea (olive) fruit oil* (organic olive oil), sodium lauroyl oat amino acids (anionic surfactant from oat amino acids), parfum (100% natural fragrance), coconut alcohol, sodium sulfate (anionic surfactant from coconut), dehydroacetic acid (preservative agent), benzyl alcohol (preservative agent), citric acid (pH regulator), linalol (component from fragrance), limonene (component from fragrance), citronellol (component from fragrance).